Have you ever heard of the term “ERP” before? Not exactly sure what it is or why it is important to process manufactures and chemical distributors? Have you tried researching it and found it overwhelming and a little confusing? You are not alone. As a leading developer and provider of ERP software solutions, we are often asked to explain ERP and its benefits. ERP stands for Enterprise Resource Planning. It is a business management software solution designed to help companies manage various key components of their business including accounting, customer relationship management (CRM), manufacturing, and procurement. The main purpose of an ERP solution is to bring all facets of an operation into a single centralized database and user friendly application to streamline processes. When implemented correctly, ERP will improve workflow, automate business processes, reduce redundancies and give everyone in the organization access to data that is accurate, current and complete. Now that you know what ERP, you probably are asking yourself “But why should I use one to run my business? They are quite expensive and complex”. Although it is true ERP solutions are not cheap, the benefits they provide outweigh the initial investment, time and effort to adopt one. Let’s take a closer look at 5 advantages an ERP software solution can have on your business. Managing information is a big challenge that many businesses face today. Having multiple systems often leads to many conflicts and errors with your business data. Therefore, a huge advantage to having an ERP solution to run your business is that all your data is in one single location. This helps improve the accuracy, consistency and security of your business data. Likewise, with centralized and consistent data, information sharing between departments such as Customer Service, Sales, Marketing, Operations, etc. enhances collaboration throughout your business. Everyone will have access to the same information in real-time allowing everyone to be on the same page on achieving the company’s goals. An ERP software solution provides you with a bird’s eye view of every aspect of your business. It can easily generate useful reports and analytics about your business in real-time. Knowing precisely where you stand you can make better informed business decisions with confidence regarding your company. A lesser known benefit of an ERP solution is that it can assist you with being compliant with various government regulations such as the Globally Harmonized System (GHS). A good ERP system will keep you compliant without adding non-revenue tasks to the work load. This is achieved with integrated compliance data combined with built-in and customizable reports. In addition, industry specific ERP solutions will stay up to date on all current industry regulations to ensure that your system will help you remain complaint with ease. Having one unified system with accurate and real-time information can greatly reduce overhead costs for your business. For instance, you can save money by not having to pay multiple application licensing fees. It will also reduce training requirements and costs for end users since they will only need to learn one system versus multiple applications. As a process manufacturer and/or chemical distributor you deal with inventory management and production scheduling. An ERP solution contains tools to reduce inventory and optimize production. 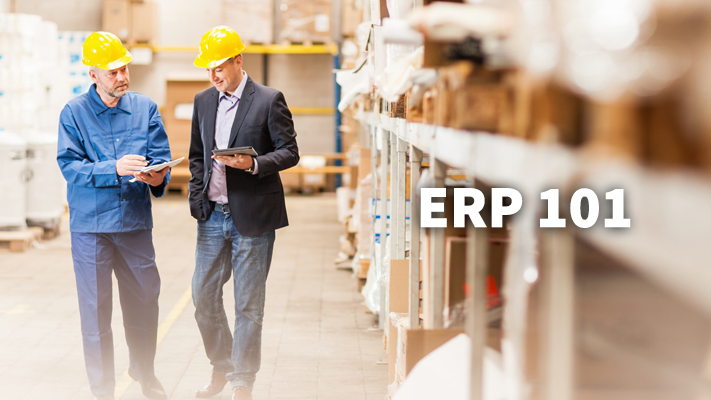 Therefore, an ERP can greatly improve your profitability and reduce overages by reducing costs and better managing the inventory. An ERP solution will streamline your business processes and make it easier and more efficient for you to run your business. It will easily eliminate repetitive processes and reduce the manually entry of information. Therefore, allowing your team to be more productive as they can focus their time and efforts on revenue-generating tasks. ERP is a complete business management software solution that integrates every department of your process manufacturing or chemical distribution operations to ensure increases productivity and better informed decisions. It ties all your business information into one centralized system so your team has access to the most accurate, current and complete data. There is so much to know about ERP that we have just scratched the surface. So if you have any questions or want to learn more, contact us today, or leave a comment below!